In the business world, you cannot fight and ignore the data away, as the interaction of data and how you analyze it is the primary driver for your business in gaining competitive business strategies. Most successful companies have built their businesses around the use of data, and even if you have the techniques and the manpower skill set that will analyze your data trends, it does you no good as it eats up your production time. The automation wonders of a Business Intelligence (BI) Tool allows you to collaborate huge amounts of data and interprets it on your behalf, then gives you a picture of where your business is currently at, helps you generate the right questions after data analysis, and aids in predicting the movement of your business without too much time getting wasted. Gone are the days when the human touch is deemed necessary with data analysis after automation BI applications have exploded which proved to be a greater partner in generating a competitive strategy with your business. Direct access to the information pool should be paired with efficiency and how relevant this information is to your needs, and a perfect solution is the use of the good old truncated RSS Feeds in keeping you updated with the news, business wise. 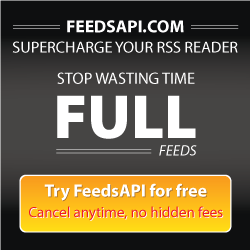 Investing in a full text RSS feed is a way to go out there and scour insights on what other companies are currently doing, and what the world honestly wants. Having an RSS feed will point out your next course of directions as you read business news, palpate the business climate, and read the comments from the customers themselves. The betterment of your business fully relies on how you can keep up to the fast dynamics of the digital world. Stepping up by learning from other business examples is the keystone to gain expertise with the field of your choice. Especially if your business is still at its prime, grabbing as many information and tips as you can is basically smart. Another thing to consider with an RSS tool is its mobility. Wherever you go, you have altogether an easy way to track your clients and the businesses surrounding you real time. Knowledge management involves the constant adoption of ideas and data from other sources and this transparency of information is the leverage you can use in business.